This blog contains commentary on a variety of topics related to profit generation and profitability management. If you have comments or questions, please contact Jonathan directly at jlbyrnes@mit.edu. If you use Twitter, please sign up to follow my Twitter account: islandsofprofit, and I will send a notification when new posts appear. In years of work on maximizing profitability, and in the billions of dollars of annual client revenues that run through Profit Isle’s, my company’s, analytical systems (see www.profitisle.com), I have found that a surprisingly small portion of a company’s business provides all the reported earnings, and even subsidizes the losses on the remainder of the business. In virtually all companies, the majority of transactions and customers are largely unprofitable, while the minority are highly profitable. 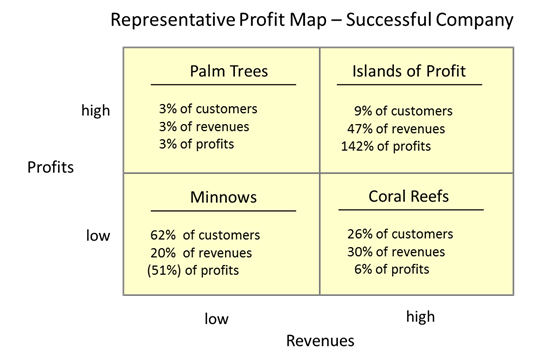 Most of the cost and inefficiency comes from the unprofitable portion (which I call the Minnows and Coral Reefs). Why give unprofitable customers enhanced services that make them much more unprofitable - and remove resources that should be spent on making the Islands of Profit customers even better served? For example, we have developed a very powerful, sophisticated system that does big data profit analytics, including profit mapping; for more, please see: www.profitisle.com. Recently, I was interviewed by Margaret Reynolds for Breakthrough Masters. The interview, on accelerating profitable growth, is now available on the web. The 0.08 carbon rimmed steel is good for drawability, but being much softer steel, it is not suitable for the whole range of nails.